1. Center the struggles facing Native American communities. That is, preach at your relatives that America does not deserve to exist because it displaced a Stone Age population, the remnants of which are still oppressed to this day. For example, radical members of the Standing Rock Sioux Tribe have been discouraged from activities intended to prevent us from distributing the oil we need to keep the lights on and our houses warm. 2. Volunteer at a local food drive or soup kitchen—and then keep doing it. This sounds fine, but the point here is to assert that there is no bounty in America except for among the hated “rich.” Being woke means pretending that a large segment of the population is starving thanks to inequality, capitalism, racism, et cetera. 3. Climate change is real, so don’t waste food. According to liberal ideology, eating turkey makes it be too hot out, thereby causing a long list of terrible problems. No really, they believe that; it has to do which fossil fuels being used to transport the food. Therefore, you must clean your plate not with pleasure but from duty, and feel miserably guilty about every bite. 4. The NFL hid the truth about concussion for decades. Don’t let them get away with it. Here’s something moonbats and countermoonbats can agree on: don’t watch the NFL. Countermoonbats shun the NFL because it won’t forbid the players to indulge in theatrical anti-American antics while the Star-Spangled Banner is performed. Moonbats don’t watch it because the game is too violent, and players are oppressed by a conspiracy to hide the truth about concussions. 5. The problem is much bigger than Donald Trump. Don’t forget to tell everyone else at the Thanksgiving dinner table that it isn’t just Trump who is awful. There are others who want to reduce taxes, which is horrible, because it will “benefit the rich.” A dutiful progressive wants only to punish the rich for producing the wealth represented by the bounty on the table. Being a wretched Grinch isn’t just for Christmas. Item 1, as far as the part about the Standing Rock Sioux, was part of a larger struggle relating the the farce that is item 3- not that climate change is real – it certainly is – but that having less food will make a difference – that is based on the false notion that humans are more powerful than nature and now are the primary force driving future climate trends. The issue was over oil and the reason Obama manufactured that crisis was to try to stop the development of yet another fossil fuel resource. b) Moonbats believe they had some life that was wonderful – in tune with nature, peaceful, the sort of utopia they keep thinking their nonsense will create when in fact it does just the opposite. And the same is true about their life and culture – basically warlike, violent. They lived short, brutal lives. They engaged in routine, relatively random acts of violence. They kept slaves. Women were raped regularly. Their choice of lifestyle and actions worked against them becoming more civilized and advancing, generally. c) The biggest enemy of those who’s ancestors came here first is themselves – and for example their penchant for consuming alcohol, which may be influenced by a genetic predisposition – but it’s still a choice, just like other lifestyle choices. The other items on the list are similarly flawed and I may return and give my perspectives on them, too, time permitting, but I have to go spend some time with family, my first priority today. 1. Regarding Native Americans and how much they’re “suffering”. Yeah, they’re really suffering…what with their Indian Casinos and all. Millions of dollars taken away from the palefaces every day in their casinos really means they’re suffering. I live in Phoenix AZ and we have four Casinos practically within city limits. None of them seem to be “suffering”. And considering that all the hired help are Native Americans, those casinos are providing jobs for the native population. Which is a good thing. Except according to liberals. 2. Regarding the NFL. If your leftist relative brings up concussions, remind him/her/it that the NFL is now the liberals’ hero. They’re “taking a knee” to protest America, so therefore they’ve been raised to Sainthood. The concussion issue is unimportant compared to protesting the evil country that allowed the NFL players to become fabulously wealthy playing a game. So the leftist relative should be singing the praises of the NFL rather than bringing up a dead issue that his lefty buddies forgot about years ago. darn it, the banks are closed on Thanksgiving so the Indian tribe members have to wait until tomorrow to cash their checks from the casino profits….this is oppression! Unless, of course, the Indians use an Evil Mobile Banking App (invented by a white man) on their SmartPhone (invented by a white man) to remotely deposit their checks into the bank today so they have plenty of cash available. Or they go to the Evil ATM Machine (invented by a white man) to pull some money out of their accounts right now, even with the banks being closed. Yep. Oppression by the white man (/sarcasm). I’d say the Indians are taking advantage of the technology and improving their lives. Which makes them smarter than liberals. Telling people to “AWAKE” to a world in which they can silence and persecute those with whom they disagree isn’t new. 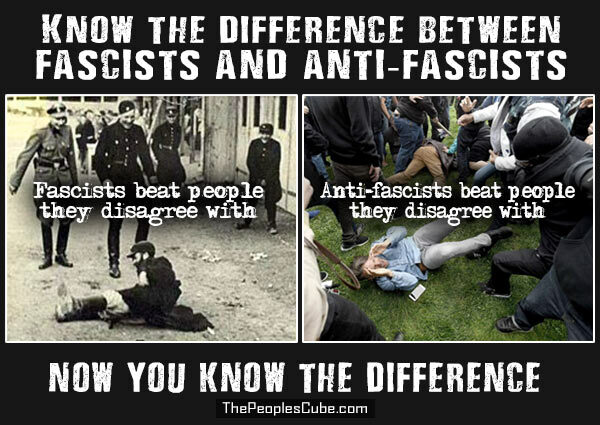 Hitler used the same divisive technique. 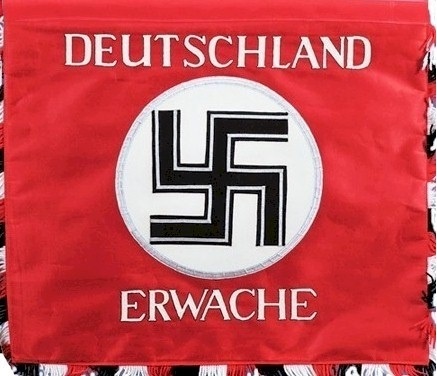 The banner reads, “GERMANY AWAKE”! Most tribes are quite poor, the ones with casinos are the exception. That said, Thanksgiving is supposed to be a celebration of the blessings that we have received in the year. Secondly, it is supposed to be about renewing family ties, not tearing them apart. President Obama did NOT serve the country in that speech. Ruining a holiday does NOT convince people. Of course, if he wanted to fragment the country even more it isn’t a bad plan. I saw that video from Mark Dice. American Thinker posted some good blogs worth to read which include a Thanksgiving special then John Wayne hosted back in 1970. Did the makeup department forget to put Joy Reid’s eyes in? I didn’t realize Newsweek was still in publication. 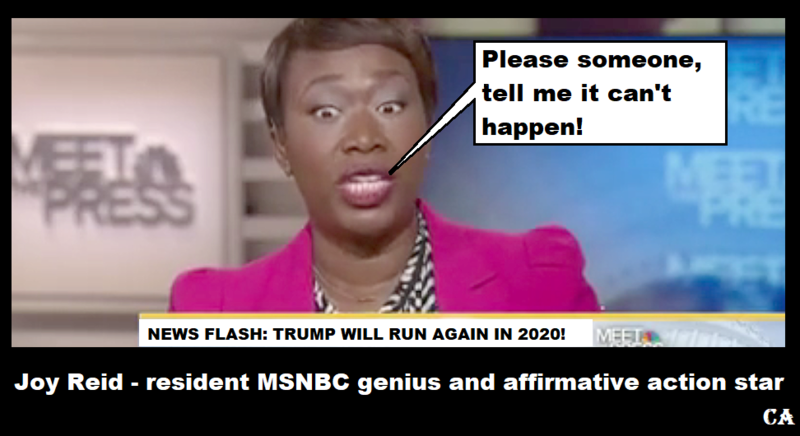 Not only Joy Reid’s eyes I’m afraid. barely. I think it’s 10 pages and a dollar. And they were all one. That’s why each one, Cherokee, Navajo, etc., called themselves a “nation.” Wait…. Nope. Taught on an rez where there was no casino. Not poor. Free everything. Free clinics, free college, all the Bernie stuff. We pay for it. The only job he has ever known….neighborhood organizer, aka neighborhood agitator. To be fair, North American Indians hadn’t yet become a Stone Age civilization. They weren’t much beyond Cavemen. Spoken language, bow & arrow, ability to build extremely primitive shelters, and…… well, that’s it. They were nowhere near even where the Mayans and Inca were. I could care less about Indian casinos. At least those are businesses and I can avoid them (I don’t gamble). I lived in South Dakota, the Sioux don’t own casinos. They get welfare and tons of it. State welfare, federal welfare, Bureau of Inidian Affairs assistance, etc. Nearly $30K a year in combined benefits and subsidies. Because of that the unemployment rate is almost 75%. Why work when you can mooch off th system.